Volkswagen will be showcasing the Golf Alltrack for the first time at the Paris Motor Show next week before it goes on sale next summer. The Golf Alltrack includes a 4MOTION all-wheel drive system, higher ground clearance, wheel arch mouldings and flared side sills that offer body protection, newly designed bumpers and many other independent exterior and interior features. 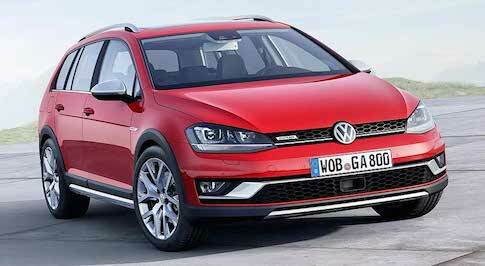 The new Golf Alltrack was designed for good performance on both asphalt and light off-road terrain. The 4MOTION all-wheel drive system is the technical foundation here, which activates even before slip occurs and prevents nearly all losses in traction thanks to a proactive control. For the first time in the Golf, Volkswagen is offering a 1.8-litre TSI with 177bhp. The direct-injection four-cylinder turbocharged engine is ideally suited for use in the Golf Alltrack, because it develops an impressive maximum torque of 280 Nm from a low 1,350 rpm, and maintains this constant value up to 4,500 rpm. The Golf Alltrack 1.8 TSI is equipped with a 6-speed dual clutch gearbox (DSG) as standard. The versatile vehicle has a top speed of 135mph and accelerates to 62mph in 7.8 seconds. This agility contrasts with an economical fuel consumption figure of 41.5 mpg which equates to 158 g/km CO2. The independent front end of the Golf Alltrack features a low-profile radiator grille crossbar in the upper front area that sports a brushed aluminium look that extends into the headlights. The radiator grille in honeycomb design with a chrome "Alltrack" badge was designed in matt "Black".